Yep, it's that time of the week again...my campaign manager/running mate Oreo and I are off to somewhere new for my world tour! As a candy date, I've been doing my best to get know my Blogville friends better by visiting them and going fun places with them. This week we're headed to Idaho. I've heard some interesting things about Idaho, especially because my mom's 8 year old brother has been learning a whole lot about Idaho for school these past few weeks. I can't wait to see what it's actually like there! 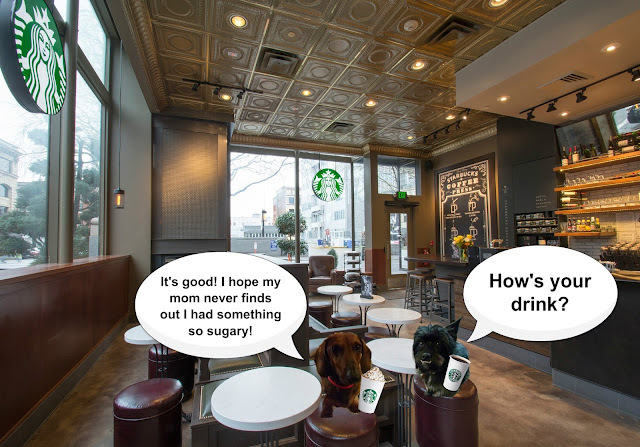 Our trio of pals told us to meet them at a local Starbucks so we could work out where we wanted to head first. Sure enough, Mabel, Hazel and Mr. Bailey arrived! We all decided to head to a potato farm first. There are a whole lot of potatoes in Idaho! 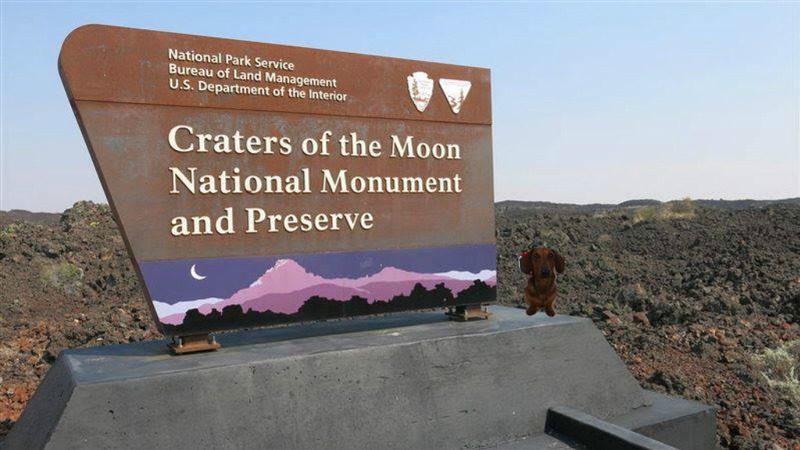 Oreo, Mabel, and Hazel had the opportunity to kick off the fun. Then Bailey and I went on a little adventure! 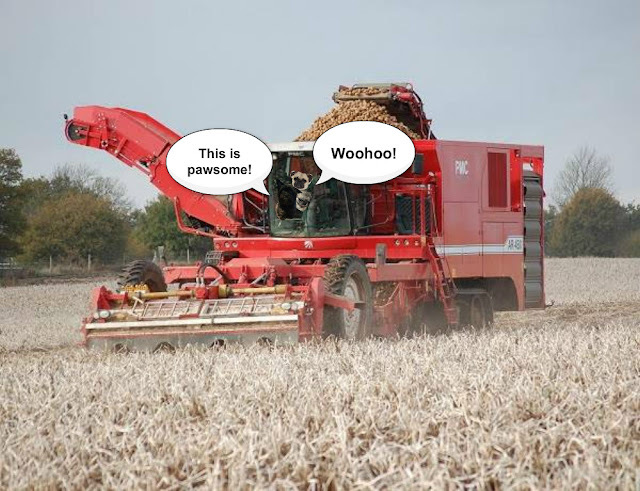 Off to the potato museum! After taking a picture with the huge potato, look where we went! 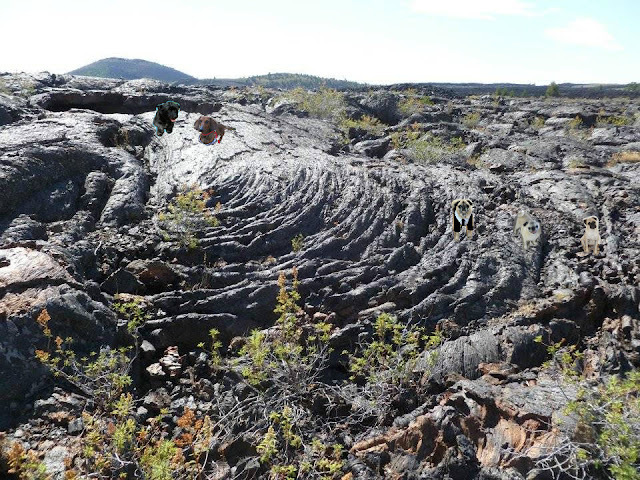 The Puggies told us sometimes lava flows here, but luckily we didn't run into any during our visit with them! However, we did have a lot of fun going off and exploring. Can you find all five of us? Hazel is especially sneaky! 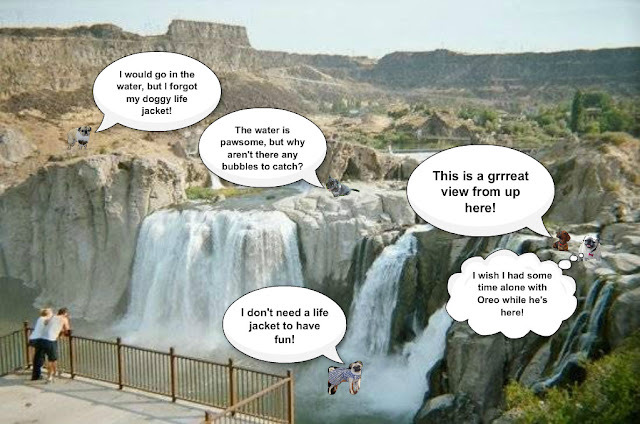 Next we headed to Shoshone Falls! You might know that Oreo and Hazel are boyfriend and girlfriend. Towards the end of the visit, I noticed the two of them seemed disappointed they didn't have time to be alone together. So I decided to plan a special night for the both of them! They just loved having time together! Goodbyes were said, and before long, Oreo and I were resting in a nearby Wiener Suites. We didn't visit one of the suites last week because a wild bison took us all the way home from Utah. 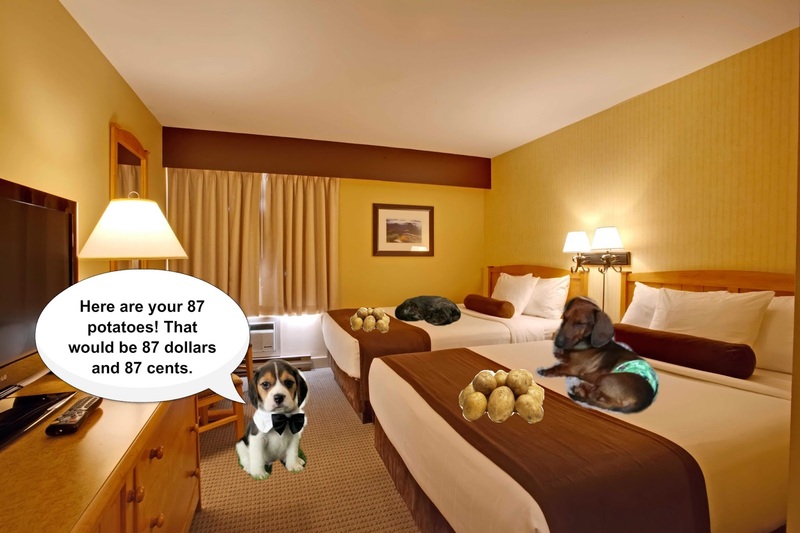 Anyway, visiting Idaho kindled our passion for potatoes. So the doggy server gave us 87 of them to chow down on! Oreo and I had so much fun in Idaho! We got our potato fix, swam, explored, and Oreo and Hazel got to share some romantic moments together. Chris' Care Tip #16: Although it isn't too serious of an issue, it isn't a good idea to give a dog a name like Bo (or Beau), Po, Mo, Joe, or anything that rhymes with those names. Sure, those names might suit some dogs, but they rhyme with the word "no", which could confuse your dog. Aww, it's sweet that Oreo and Hazel got some couple time! PeeS: We had an LBR dog named Noel whose nickname was No-No. But it was okay -- she was deaf, so she couldn't hear the NO anyway! BOL! That was some great sight-seeing! What a fun visit!!! 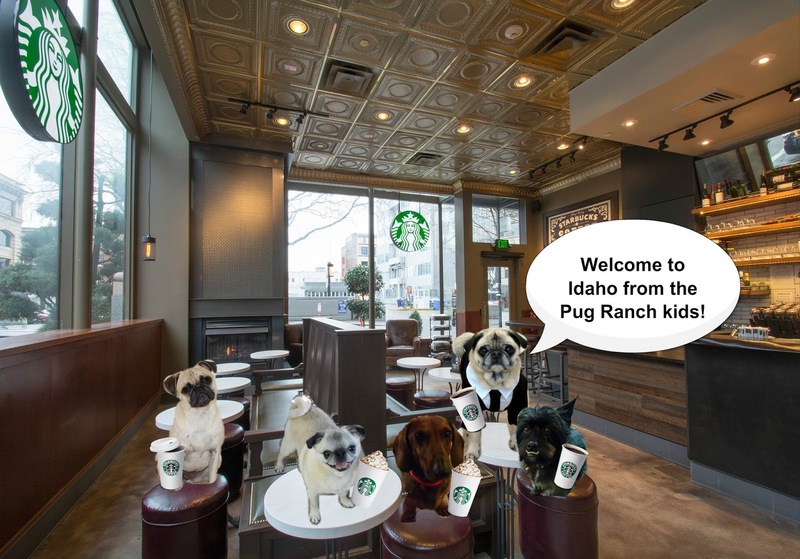 Idaho just wouldn't be Idaho with the Idaho Pugs and potatoes!! 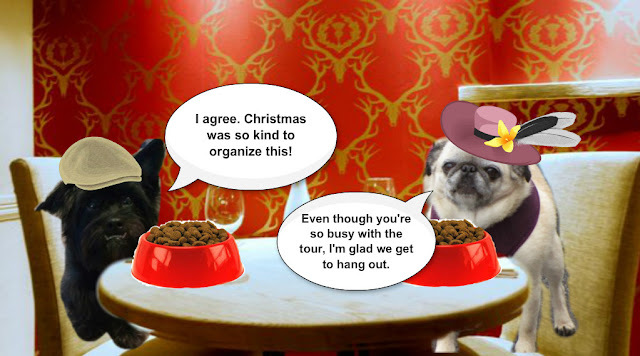 We love those three little pugs, great trip! WE so enjoyed showing you a few places in our great potato state! Hazel was really happy to get some alone time with Oreo! 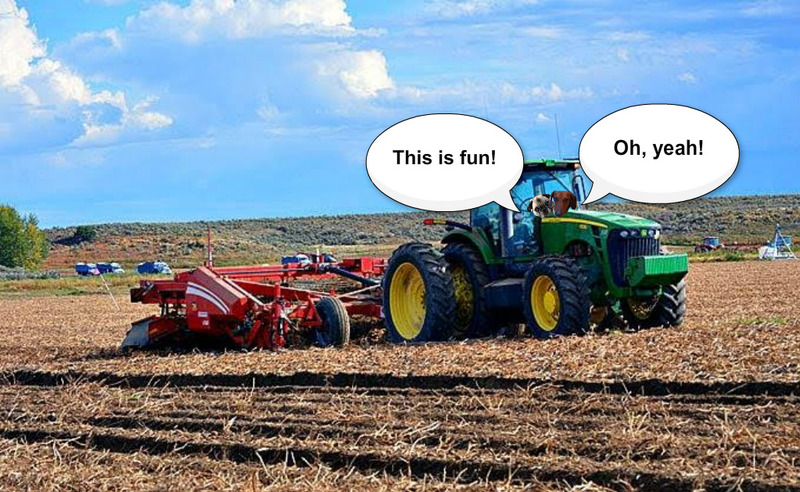 We knew you would have fun in Idaho. Those Pugs are great doggies. They are only 2 hours away from us! How about some mashed potatoes? WOWZERZ! 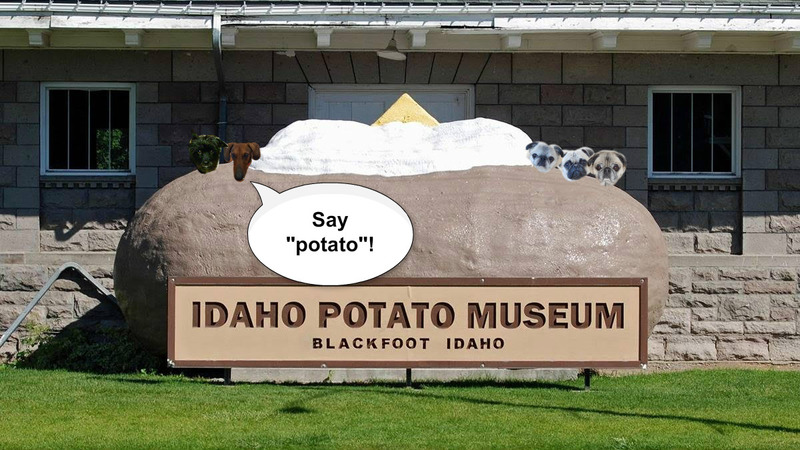 Lookz like u'all had sum great timez out in Idaho - even a 'tater muzeum - how fun wuz that. Mom likez that little Beagle pup that brought u an'Oreo your 'taterz at the Weiner Suitez. Any time spent with our pals Hazel, Mabel, and Bailey HAS to be a whole lot of fun!!! Those were some mighty big pieces of equipment you got to ride on - glad none of you fell off. 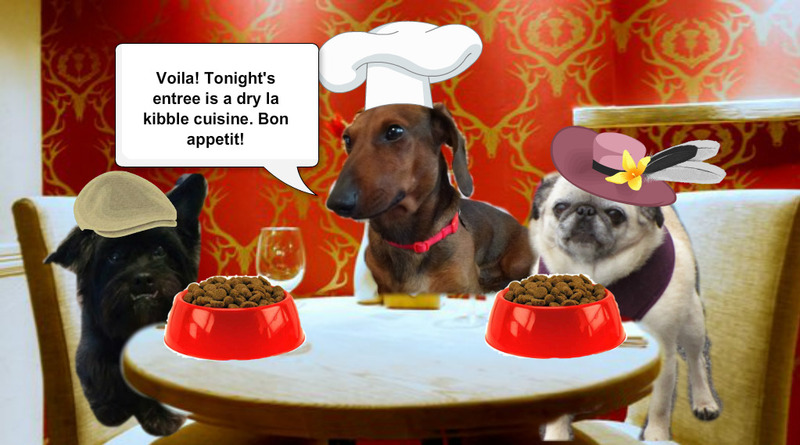 And we just know that Hazel and Oreo must have been thrilled with that special time alone at dinner. Wow! That was quite a trip! That was my best visit by far cuz i got to see my girl Hazel. It was amazingly fun. OMD, that was sooooooo cool!!!! I loves me some potatoes!!! !